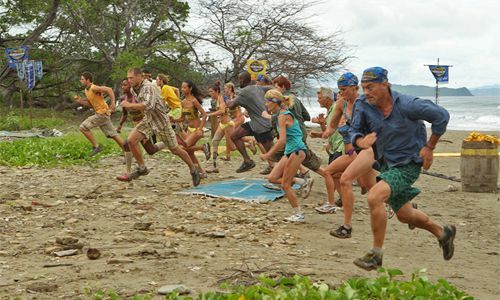 Cultural Wormhole: Survivor: Nicaragua - "Glitter in Their Eyes"
It's a mad dash for immunity on 'Survivor'. Jealousy reared it's head on last night's 'Survivor'. For some reason Marty and Jimmy T. have had it in for Jimmy Johnson from day one. They both hated the fact that the rest of the Espada tribe looked to the NFL coach for leadership and not to either of them. The thing is, Jimmy Johnson was a fairly good chief for the tribe. He was good an encouraging those that were having doubts about their abilities and could pump up the team before a challenge. Tyrone didn't want to sub-out during the challenge because he felt that he was in a groove (which didn't work out), but he finally relented when Johnson told him to. Jimmy T. is all talk. When he subbed into the challenge, he wasn't very effective at all, but still bragged about the fact that he has moves and abilities that the team are not exploiting. Here's a move for you Jimmy T., go catch some frikkin' fish and feed the team. Aren't you a fisherman in real life? Anyway, he's got a big mouth and no filter, so he's bound to get voted out sooner rather than later. Jill remains one of the more level-headed members of Espada. I think she's able to read through Marty's b.s. and was able get him to disclose the fact that he had the hidden immunity idol to the rest of the tribe. She's also smart enough to go with the flow and voted the coach out when she realized that Marty was dead set on it happening. Not much happened over at La Flor, unless you count the apparent possession of NaOnka by a demon. This young woman is mean. She'll knock a one-legged woman over for a hidden immunity idol clue. What I don't get is that she's picking fights with Kelly B, the girl with an artificial leg and Judd, a guy with very few functioning brain cells. Does NaOnka see them as weak and feel compelled to push them around or make enemies of the them? She's lucky she's in a strong alliance or she would be going home soon. The Brenda Alliance at La Flor appears to be staying, unless something major happens, like NaOnka doing something so awful that they have no choice but vote her out as they did Shannon. Espada still sees itself as one group for the time being, but I have a feeling that Dan (due to his weakness) or Jimmy T. (due to his mouth) aren't going to last too much longer. At least, Holly didn't do anything crazy this week.